You can probably tell why it intrigued me. The video speaks of the work of two researchers called the Dunning-Kruger effect. 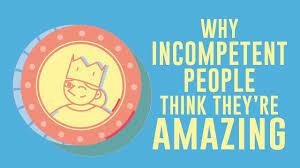 The pair claim that the reason why incompetent people think they’re amazing is because they don’t know what they don’t know. People who are just learning about a concept or an ability look at what they’ve come to know and be able to do, and they take pride in the little bit they do know. But this is nothing in comparison to what they could know about it. Their ignorance of the fullness of a concept or ability forces them to look only at the minimal competence that they have, and think they’re amazing for what they can do. They have no benchmark other than themselves to judge. And obviously, they’re the best. In contrast, those who are actually quite competent in a concept or ability aren’t always aware of their competence. This stems from the fact that they know there’s a lot they don’t know. Competent people know that there’s so much more to learn or do to be the best at something. There’s room for improvement, and this must mean that there are far more competent people in the concept or ability. So, while trying to judge ourselves on our competence of a particular concept or ability, we will almost always misjudge. Either we’re incompetent enough to not realize that we’re not the best, or we’re so competent that we assume others around us have a similar or greater competence. We can judge others well enough in comparisons, but for ourselves not so much. This strange, upside-down premise made me think about a particular concept that we often have difficulty pinning down in our own lives. Putting others’ needs above our own. Thinking of others first. Serving. There are times in our lives when we think to ourselves, “Yeah, I got this whole humility thing down. I’m good. Not like that person over there.” And immediately we hear the sound of air pouring into a balloon, as our head gets just a little bit bigger. Any humility that we thought we had goes out the window because there’s not enough room for it and our ego. But think about the most humble people that you know. What is the typical response of a humble person when you tell them that they’re very humble? It’s appreciation mingled with a statement of how they’re not that humble. Those who are humble know that there’s so much more pride to root out of their lives. That being proud of what little humility they have will quickly undo that small amount of humility. The prideful think they’re humble and prove it as they lord their humility over others. But the humble know their pride and seek to serve in spite of it. Better to discover humility in another, than seek after humility for ourselves. Let’s look for opportunities to put others first and serve them. Humility will come, but we’ll know better than to point it out in our lives. The title screen of the video mentioned below.